RWC and AIWF have teamed up to bring you high-quality professional wrestling. 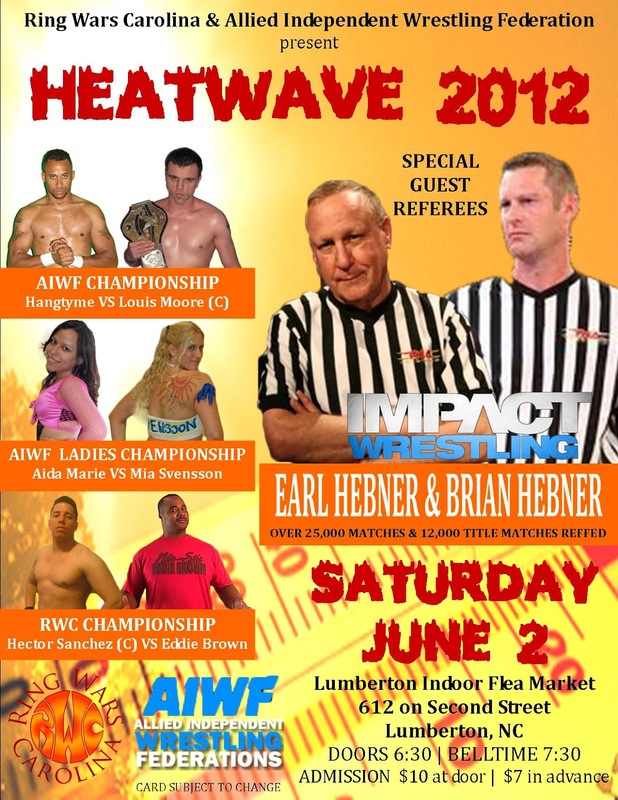 The road to HEATWAVE 2012 has officially begun, and will lead us to the event in Lumberton, NC on June 2, 2012. RWC's very own Hangtyme will take on the AIWF World Champion Louis Moore for the Title. RWC's Mia Svensson will face off against the debuting Aida Marie, where both women are looking to be the 1st ever AIWF Women's Champion. The returning "Nite-Stic" Eddie Brown will be challenging the new RWC Heavyweight Champion, "Dirty" Hector Sanchez for his Title. Plus more action from AIWF and RWC. Just to make sure all Championship matches are called fairly, RWC has pulled in the BEST and most Notorious referees in the business. We are talking over 50 years of calling some of the biggest matches in WWE and TNA history. Earl and Brian Hebner will be officiating the title matches. With the loud, "You Screwed Brett" chants going on in the background, they are by far the most-known referees in the world. These men have been involved in more wrestling Championship matches than anyone in the world. Come out to Meet and Greet The Hebners June 2, 2012 at the Lumberton Indoor Flea Market when RWC and AIWF present HEATWAVE 2012! Prefer to get your tickets the day of the show? Tickets will be available at the door for $10 the night of the event. Do you have what it takes to be in the ring on National TV? Here is your chance to prove it. If you think you can hang with the BIG BOYS, come and find out from the Legendary Earl " Damn right I did" Hebner and Bryan" voted Best Ref " Hebner. You see them EVERY week on TNA IMPACT Wrestling. Learn from the men who have reffed over 12,000 WWE, TNA Title matches. Why go to a seminar where they take your money and rehash old times or older guys who never get in the ring. Find out what the big boys are looking for RIGHT NOW!